This is Harper's artistic rendition of our family. 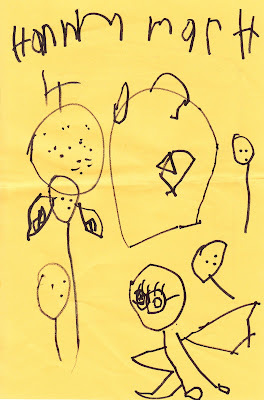 Clockwise: our house, Henry, Pep (the cat), me (I'm the one with long eyelashes and wings), Harper, Emma (those are pigtails coming out of her head), and the sun directly above Emma's head. A professional photographer couldn't have done a better job at capturing our family! Beautiful, Harp. She's right on with the mommy picture. It's perfect, you must have wings because you're super mommy! Hi Sheila, it's Katie from Katie's Nesting Spot, just wanted to tell you I'm going to go add your Teacher Appreciation gifts to Friday's post on ABC about End of the Year gifts. Hope that's okay! A true masterpiece...I love it. I'd be curious to see what her rendition of me would be. Sheil, as always you look beautiful and so put together. I think as indicated by the sun she has a sunny, bright disposition. Sooooo cute!